This home is not only beautiful but has a resort like setting! The backyard is absolutely lovely and a wonderful place to entertain or just enjoy a quiet afternoon by the in-ground pool!! Pool features an added new (2016) electric cover for safety! This stunning 2-story, custom built home is located in the gorgeous Country Pond Subdivision! 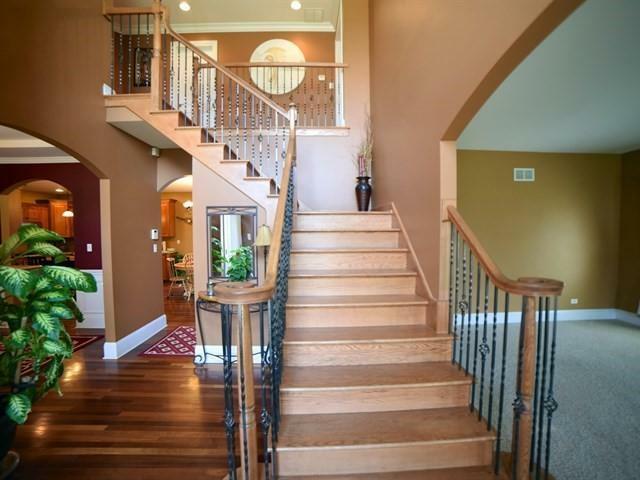 Entering the home you will first be wowed with the 2-story entry and custom wood staircase! The gourmet kitchen features Brazilian cherry hardwood floors, granite counter tops, maple cabinets & all stainless steel appliances. A chefs dream! This home has loads of extras, including a lovely all seasons sunroom off the pool area! Crown molding, pillars, wainscoting, tray ceilings, skylights and all hardwood throughout the 2nd floor are just to name a few of the upgrades in this beautiful 4 bedroom 2.5 bath home! All bedrooms feature walk in closets! Come see, this is priced to sell!